Positive thinking can be a great way to motivate yourself to keep healthy habits…but so can negative messages, like a fear of failing. A new review of the psychology behind motivation gives us four ways to decide when a positive or negative message will work best. Do you feel like you’re very involved in this issue, and knowledgeable about it? If so, a negative message may work better, because you understand why the negative outcome is bad, and what you can do about it. On the other hand, if you’re trying to convince somebody who only has a casual interest in the subject, a positive message would work better. Will you focus on the details, or just the overall message? Similar to the first point, if you’re willing to digest all the little details that make up a message (for example, if you go and read up obsessively on your chosen subject), negative messages will work well. But somebody who is more inclined to skim the details and only listen to the overall tone of the message is likely to be put off by negative messages. If you don’t want to dig into the details, keep the message positive. How certain is the outcome? If something is mostly certain — say you’re doing great on your diet but want a reminder not to fall off the wagon — positive messages seem to be best. But if you’re not so certain whether something will work out, a reminder about the negative consequences may be more effective. How do you feel about risk? If you don’t like to take risks, you’ll probably respond better to positive messages about the wonderful things you will gain by doing something healthy. But if you’re a risk seeker, you’ll be more motivated to take action when you’re reminded of the negative outcomes. 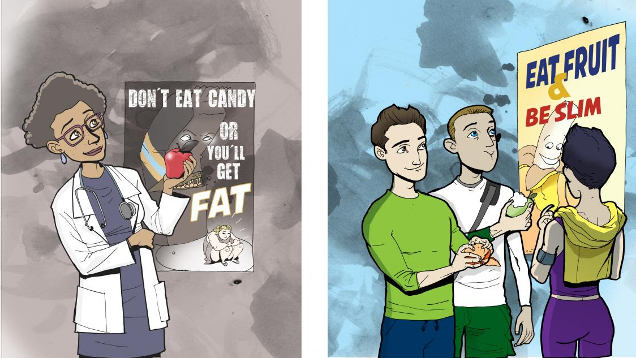 The Cornell scientists based their tips on public health messages and how large groups of people responded, but it seems likely that the same points apply to self-motivation. Someone who fears the Blerch probably understands how exercise will help them avoid obesity and depression, and fears that becoming the Blerch is likely to happen if they don’t act fast. Meanwhile, the best candidate for a positive “Running is good for you!” message would be someone who doesn’t know much about exercise, but likes the idea of looking and feeling better and believes that they’re likely to succeed if they try. Which messages work for you?